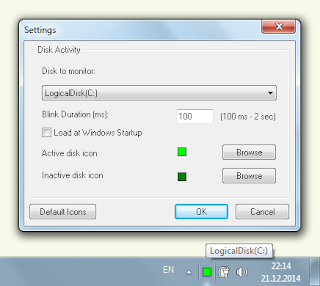 Disk Activity Indicator is a little application that displays customizable blinking icon on the System Tray whenever selected hard disk or USB media is accessed. Disk Activity Indicator can be useful if your PC doesn't have a HDD led (laptop/ultrabook) or if you connected to remote PC using RDP or VNC/RFB applications. With the Settings dialog box you can select which of the logical disks or hard drives you want to monitor, specify update interval and customize the icons. Additionally, there is an option to run the program at system startup.